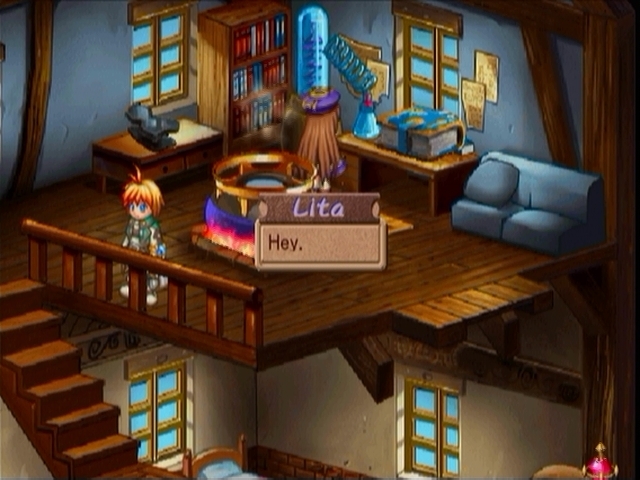 All right, so last time we played Lita gained a new, essentially permanent status effect. 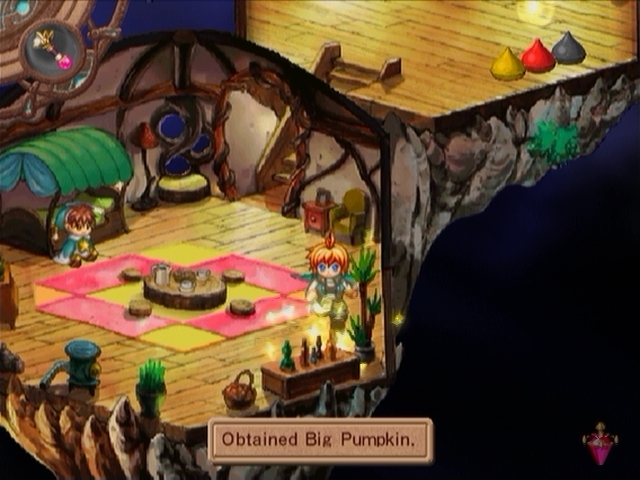 The game tried to explain it with a tutorial, but I'm going to go over it again a little bit here. 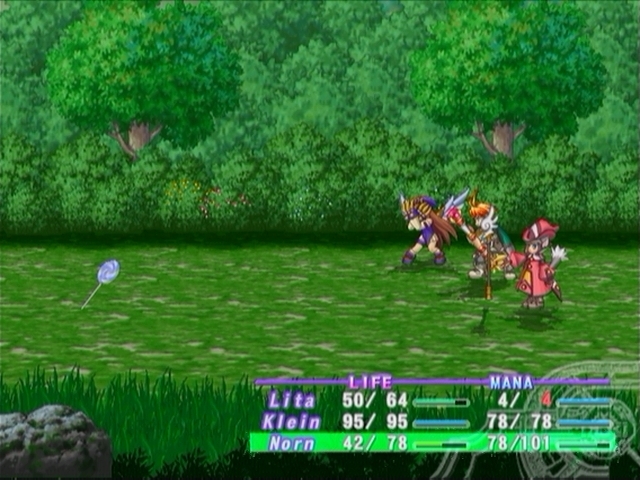 The obvious impact Lita's sickness has is that her MP steadily falls. But I don't mean her current MP  I mean her maximum MP. Notice in the above shot she has 43/43 MP. But when her turn rolls along, it drops to 42/42 instead. 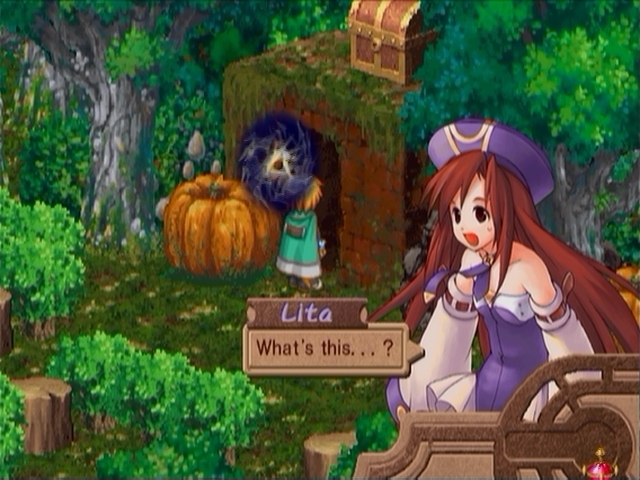 Remember, Lita's MP is already pretty low, so watching it constantly fall ever further kinda blows. 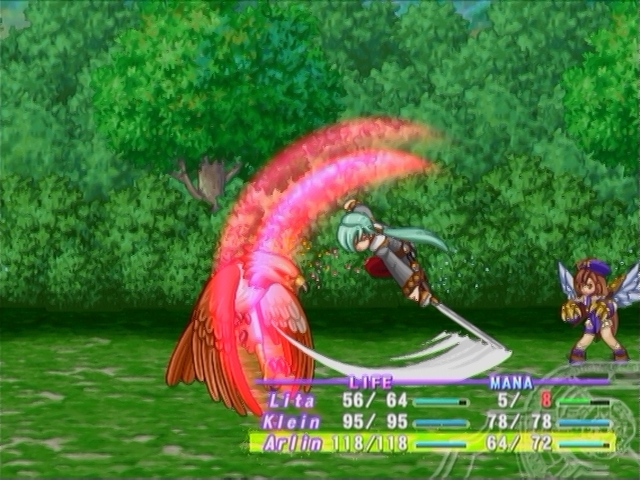 This also persists between battles, so Lita's MP can plummet pretty far if you let it. But there is some good news! 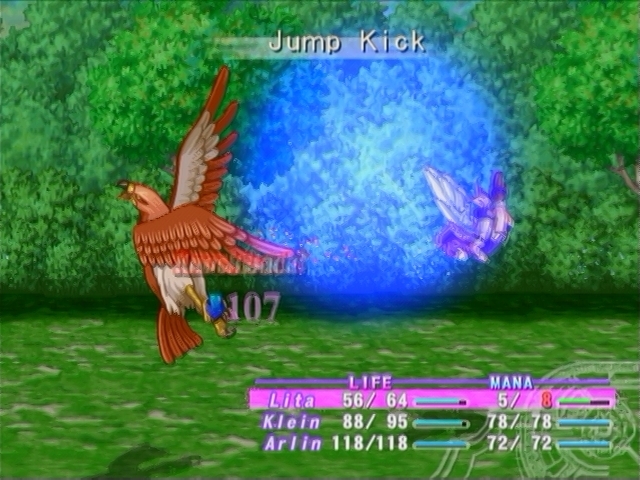 When Lita's MP falls far enough (something in the 2/3rds ballpark of her realmax MP), her wings pop out. This lowers her maximum HP, but also increases all of her other stats (including defense, curiously enough, to help lessen the blow). At somewhere around the 1/3rd mark, it happens again. Her MP does actually bottom out somewhere before zero, but it still gets absurdly low if you let it (I think right now it stops at 4). 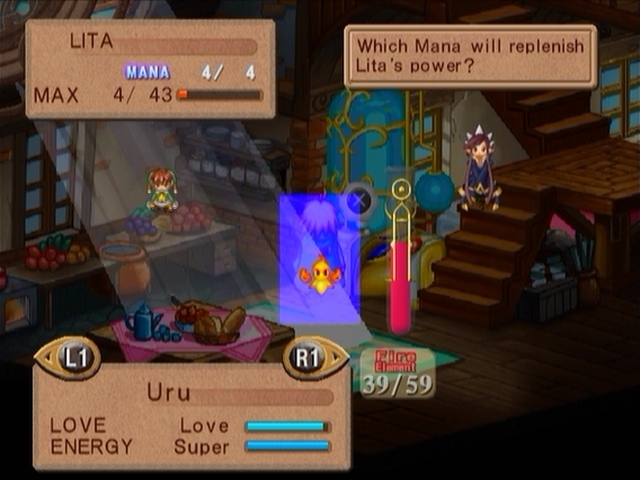 By understanding and properly manipulating this mechanic, you can shift Lita to favor balance/durability by keeping her MP as high as possible all the time, or you can let it fall and watch as her already solid offenses fly through the roof. 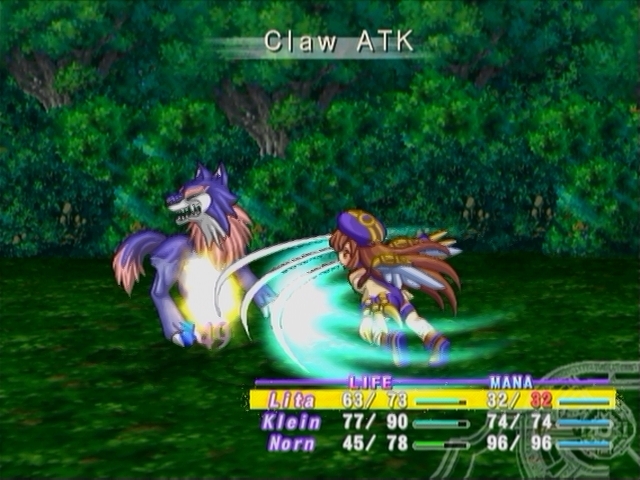 By the way, remember that Lita's standard attack constitutes a half turn or Double Type or whatever you want to call it. Basically, if you have her use her standard claw swipe, then she won't lose an MP on her next action (because it's still technically the second half of the same turn). Also, bear in mind that Lita's current MP will not decrease (unless it's the same as her max), so you can use your specials early on and not even really notice the difference. 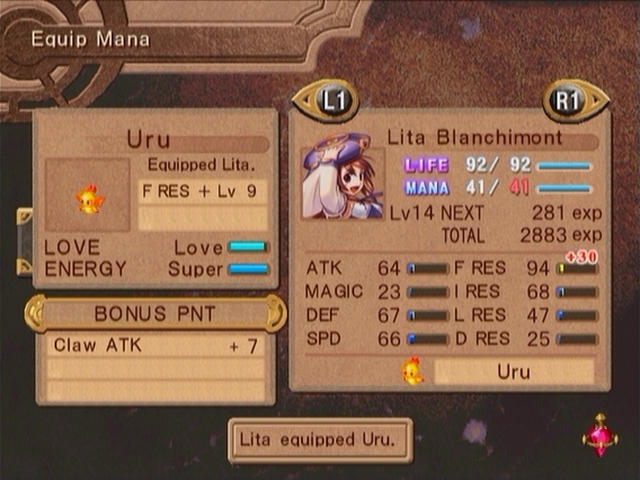 To summarize, this mechanic plays Lita's strengths up even further, and it's actually kind of awesome. Oh yeah, I said I'd talk about Arlin a little, but actually he's not that interesting right now beyond having stupidly high stats. 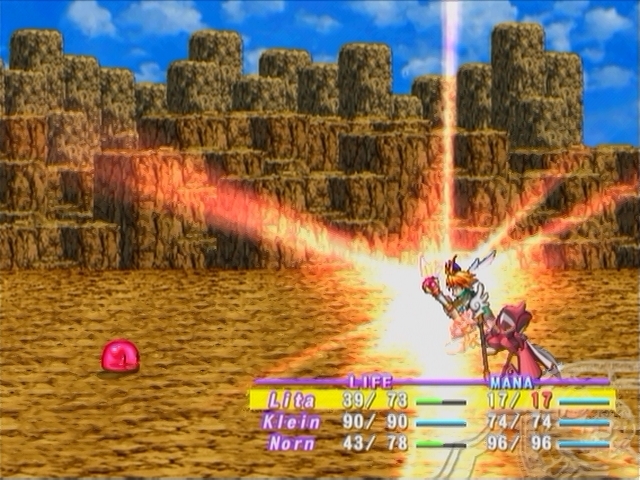 Here's a picture of him using his magic attack. 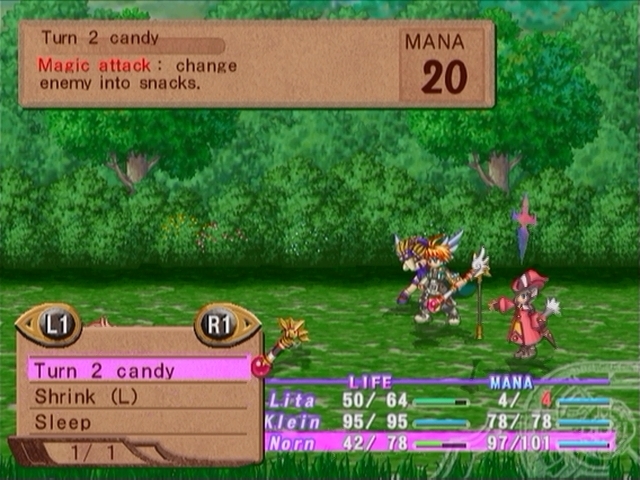 Meanwhile, Norn picked up her next ability, Turn 2 Candy. Turn 2 Candy turns an enemy into candy (shocking!). 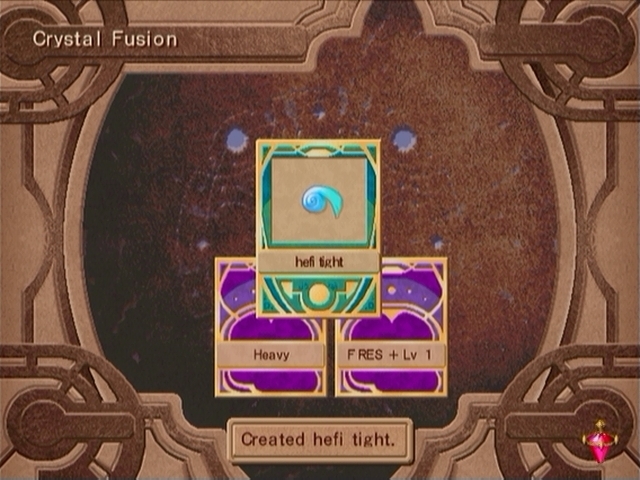 For some reason on my first playthrough I decided this ability was stupid and I didn't want to use it. 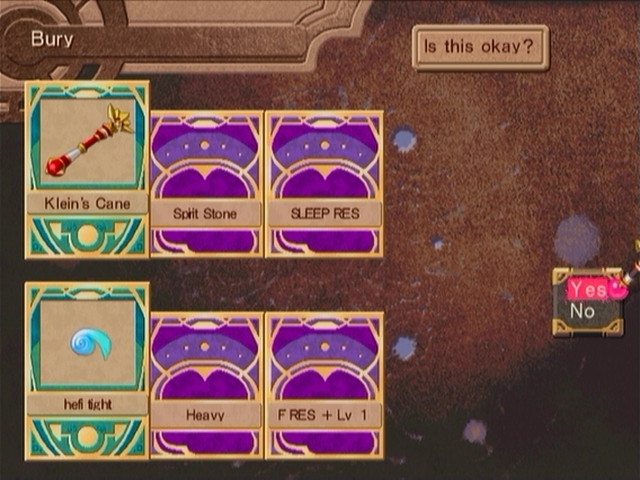 Well, bully on me, it turns out this ability is actually kind of cool and I'm pretty sure it's necessary to complete at least one shop synthesis recipe. Even if you don't have a sweet tooth it's still basically a death spell. 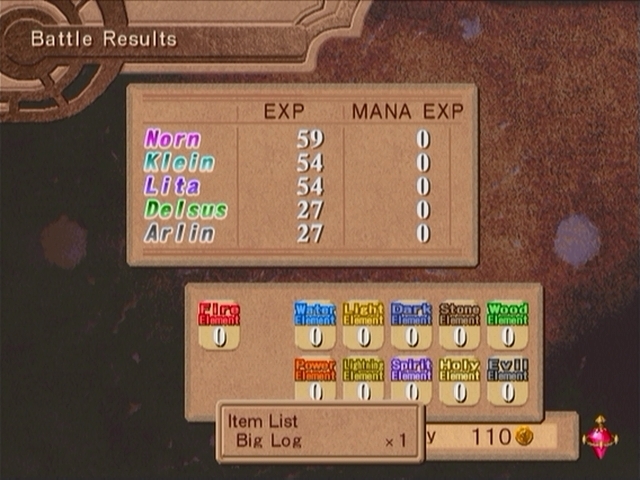 Meanwhile, you might remember Zeldalia talking about equipping Mana. This is another interesting mechanic of the game. Basically, we can pair a character with a Mana and that will give them some sort of parameter boost (for example, Popo grants HP/MP regen to Klein). 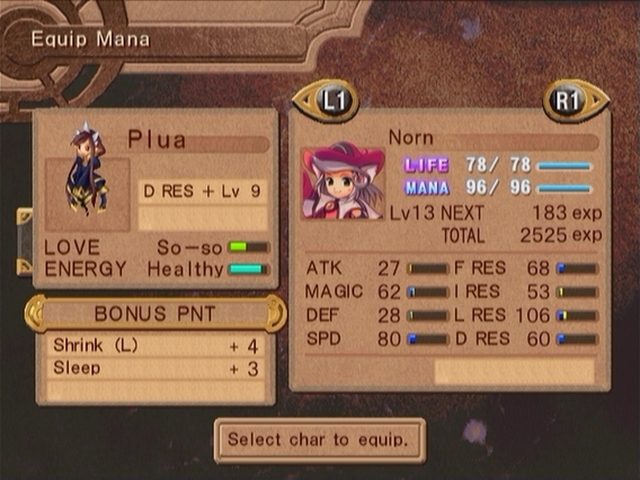 Furthermore, after battles your Mana will gain EXP, and when they level up (at 100 exp), they will confer point boosts to certain character skills. 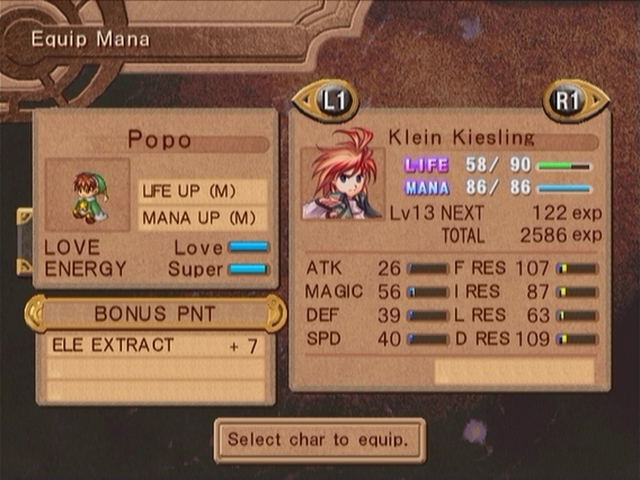 Again, for example, when Popo levels up he can put 7 points into Klein's ELE EXTRACT skill. 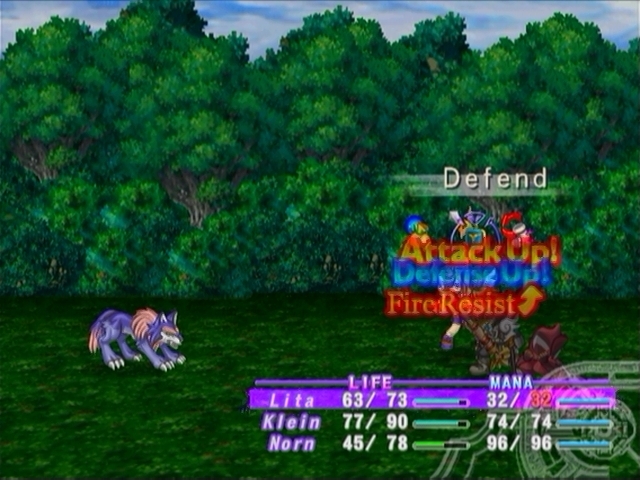 Since Lita and Norn seems to be the prevailing party, I thought I'd go ahead and assign my three mana to them and Klein. ...which actually worked out pretty well. 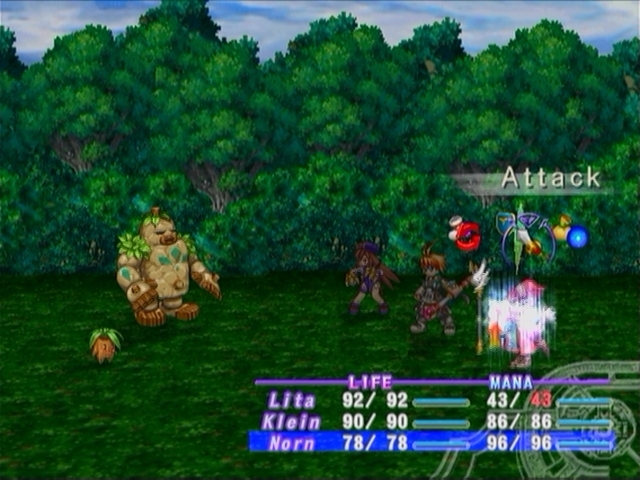 Since not everyone knows all of their skills yet, some mana don't benefit every character equally. Like Zeldalia said, this isn't something that will make or break your characters, but it's a nice bonus that you might as well take advantage of. 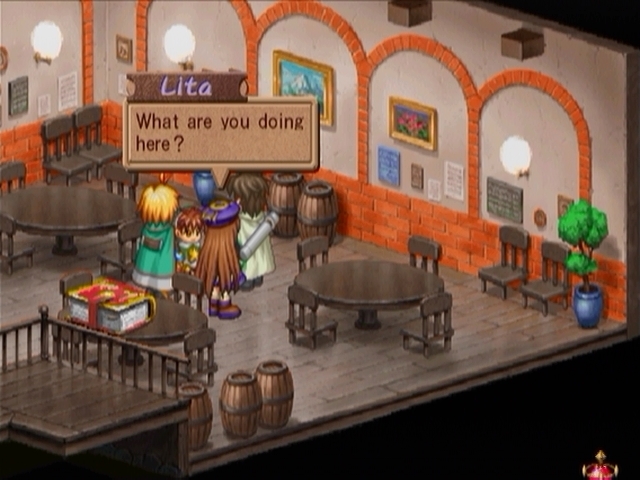 ...Now that I think about it, Zeldalia also suggested that equipping one to Lita would give her additional help regarding her condition, but I don't think I observed any such thing. I'll try to keep an eye out for that. Are you a fairy? What is this place? The name's Paka, and this is my house. I'm a self-employed smithy. How'd we end up in your house? Well, sometimes my house appears in other worlds. Nothing unusual, really. This is the Mana world, right? I can tell from how it smells. Yeah. Usually humans aren't allowed here. Here's an idea...Why don't I teach you some of my smithing techniques? I can teach you how to improve your weapons. Don't be shy...c'mon. From this day forward, I will be your sensei. You have learned all I have to teach. Congratulations! You passed. I'll give you a forge so you can smith at home, too. For today's topic, we have yet another special instructor. 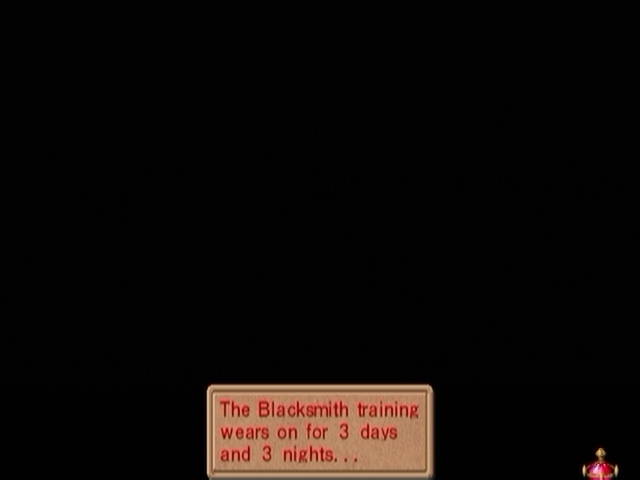 So let's hear it for professional freelance blacksmith, Mr. Paka! Hello, everyone. I'd like to teach you some new techniques. 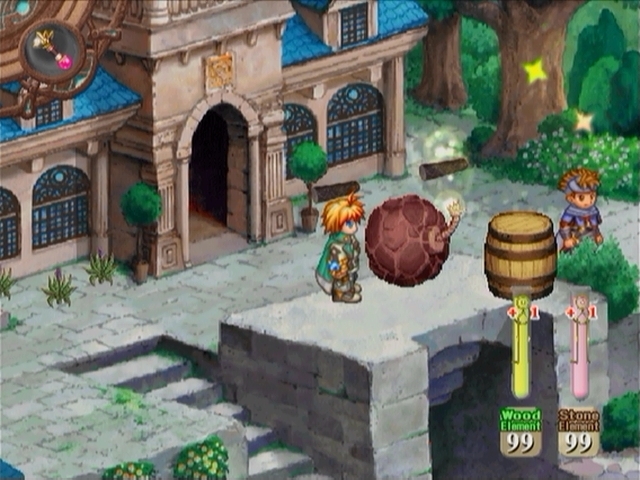 Every blacksmith needs materials  and your materials are Mana Stones. Got it? Okey-dokey...First, I'll discuss the top one: Crystallize Mana Stone. This command will let you turn a Mana Stone into a Mana Crystal. First, pick the stone to use, and then choose a Mana to assist you. The result will be different depending on which Mana you choose. I see. What about the next one? Fuse Mana Crystals is the key step. Combine two Mana Crystals together to create a much stronger one. 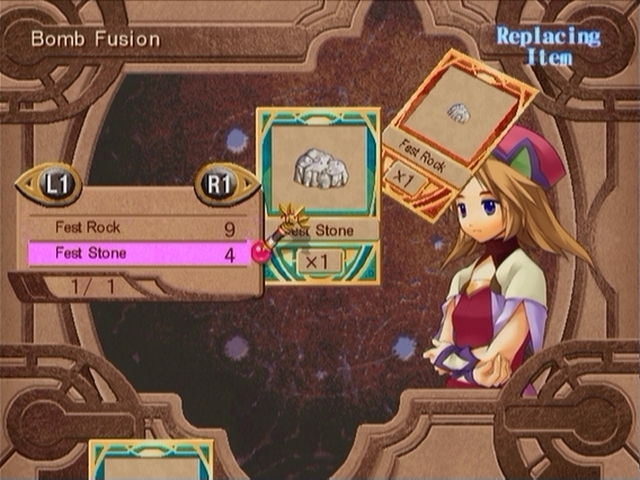 For example, combining two crystals of the same type will create a much stronger one. 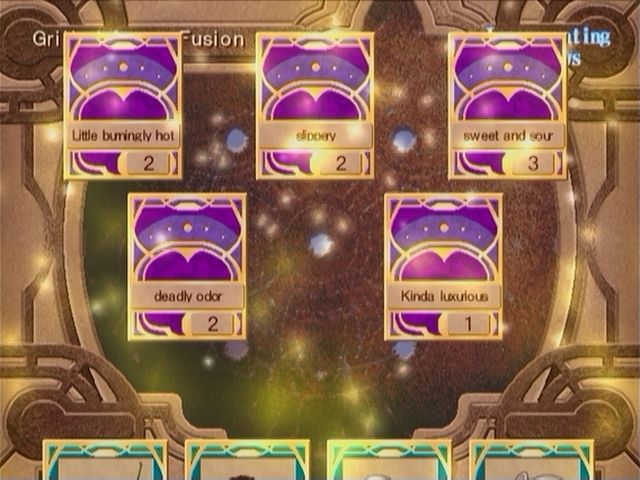 By experimenting, you can form a variety of different Mana crystals. Okay...so by combining more, I can make increasingly effective crystals. Yeah, but one crystal can only hold three effects  so don't go crazy. Keep these simple rules in mind, and I'm sure you'll have a lot of fun. So, Paka, any parting words? Do your best to discover when Mana are most compatible. Well, that's today's lesson! Bye bye, everybody! 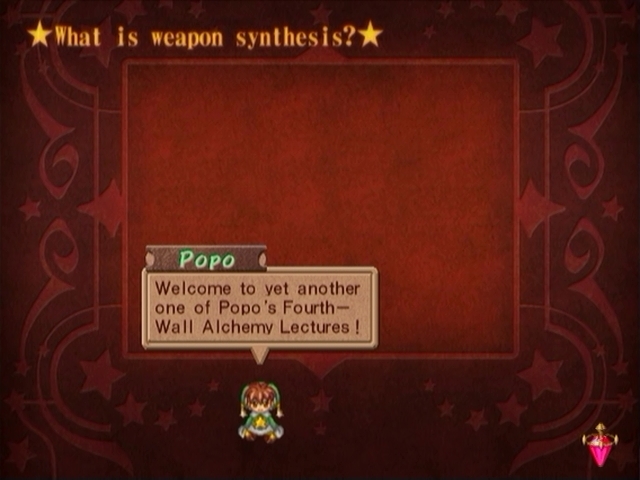 I'm not really very familiar with this part of the game's invention/synthesis/etc stuff. We'll get to see that in practice at the end of the update. 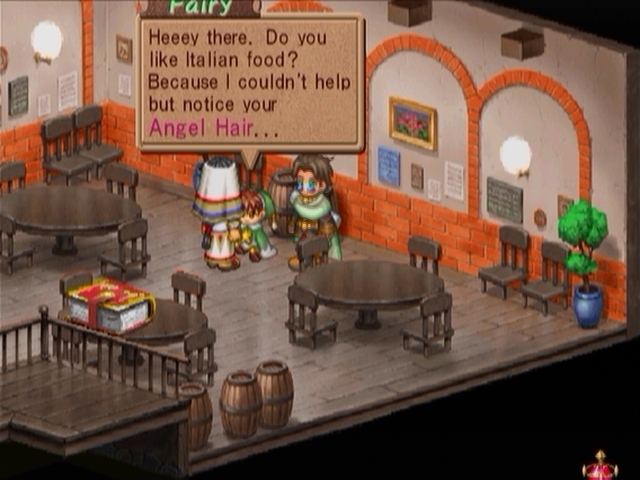 This friendly fairy merchant hangs out in the blacksmith's house as well. 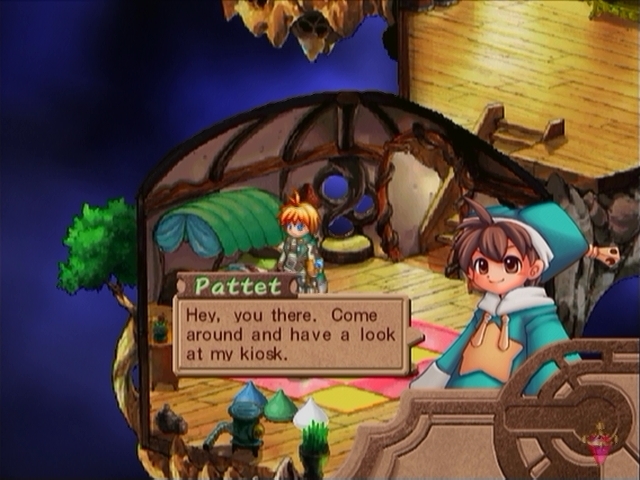 The name's Pattet. 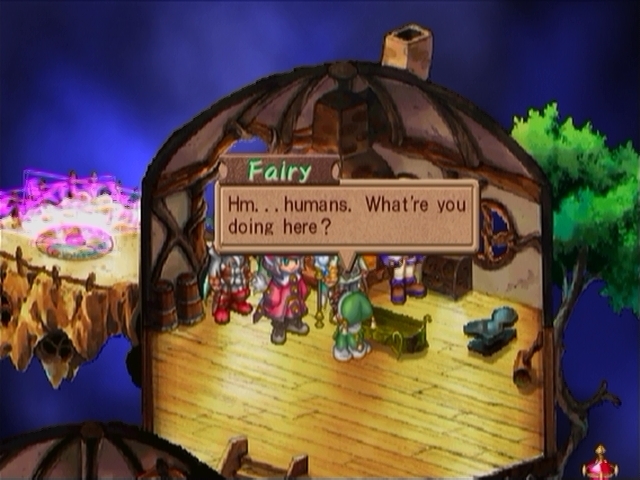 I'm a specialized fairy vendor. Hey, thanks, buddy! If my customer's happy, I'm happy. I'm always here, so visit from time to time, okay? 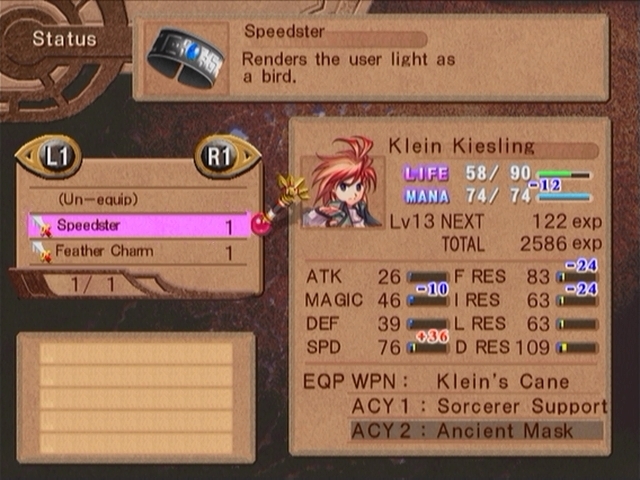 ...Including the delightful Speedster, which provides Klein with a much-needed speed boost. 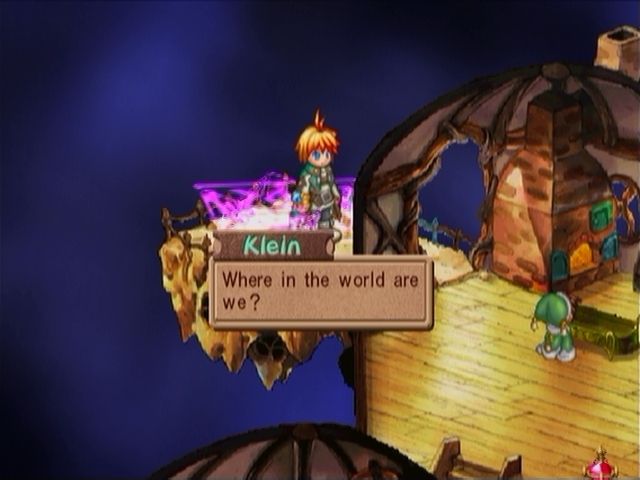 Yeah, the loss of other stats hurts but I feel Klein would benefit more from being able to act more frequently/sooner than from raw power, especially since he tends to play healbot right now. ...And it deposits us right back in Kavoc. Sweet! 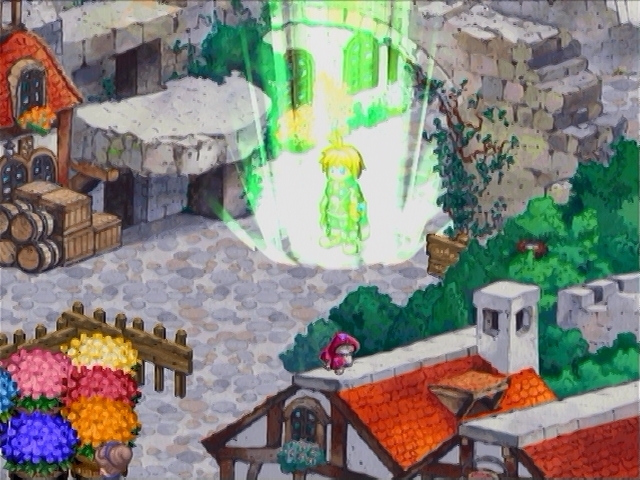 We can eventually use the smith's house as a teleportation hub, but for now it's kind of limited. Could you guys try something out for me? Yeah, it's not a problem. Thanks. I appreciate it. I want to add a rice bowl to my menu. That'd be great! I love rice, especially with stuff on top! This fried stuff is good. What is it? Oh, that's just Sweet Lando. !!! Mmmm...Sweet Lando...*drools* It doesn't only make good juice, it's great with rice, too! Sweet Lando! Gack...I don't even want to think about it. Oh, that's right. Delsus hates sweets. What about the rest of you? Like it? I'd say it was pretty good if I didn't know it was Lando on top. Don't expect me to touch it! Sweet Lando Bowl? 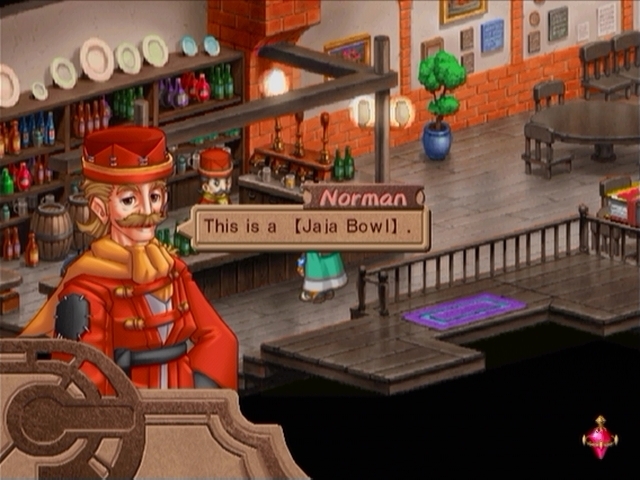 Oh, no, I have a much better name: Jaja Bowl. What the heck does Jaja mean? My name was a lot better! Well, when Lando is frying, it makes a sound like jaja, see? That's why. I still like Sweet Lando Bowl better. At least Norman's name has a nice ring to it. Anyway, if you guys like it, I'm sure everyone will. I'll add it right away. Even though Norman actually made the dish beforehand, it's still not really on the menu until we synthesize a version of our own. 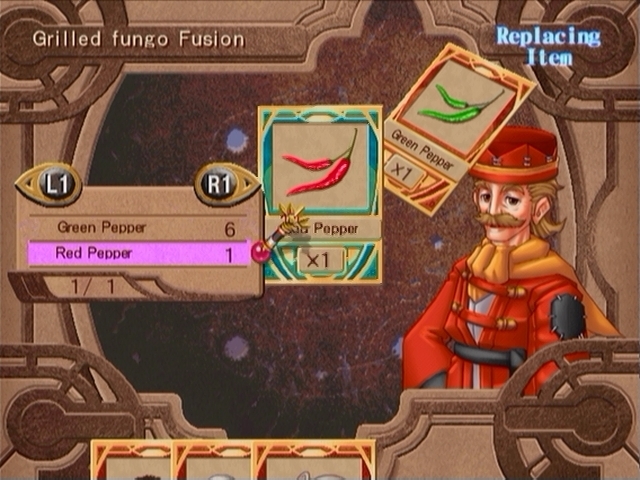 But first, I want to make some super spicy mushrooms for Delsus. These red peppers should do the trick. That isn't emotion, meow... ...It's too spicy! Woooooohoooooo! Fantastic! I feel like I've transcended mere taste-testing! Sounds good to me. We'll call it the Astral Saute. Well, I'm glad he liked it. I feel like we might be able to do even more with our mushroom dish, but that'll have to wait until I have more ingredients. 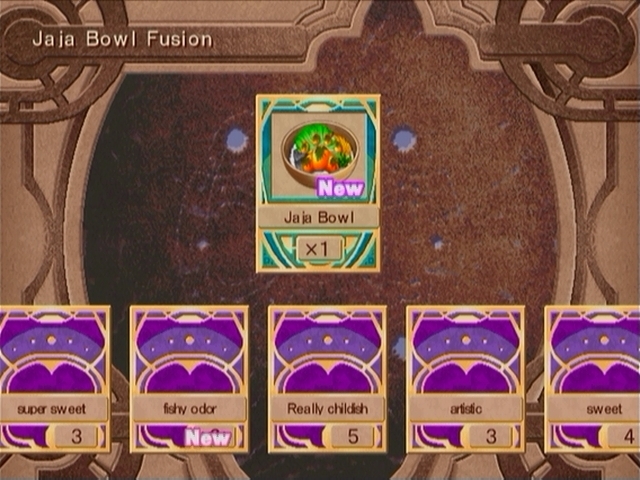 The Jaja Bowl requires a Sweet Lando, but the fish and spice are variable. None of the variations I actually tried did anything, though. Huh...I can't believe you made that out of Sweet Lando. 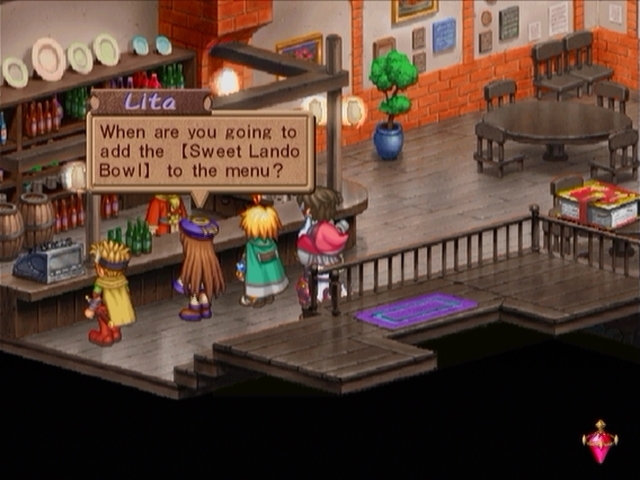 I can't believe you called it the jaja Bowl! That's right, Norman, you gotta stand up to that mean lady. Of course! We go there all the time. This might sound strange...but do you have any of their ale? Ale? Yeah, we do, actually. Could I have some? I can't concentrate without it. You probably shouldn't drink too much of this. You don't understand. Ale's my source of energy. Please...Thanks! Now I can get back to work. I'll trade you this for the booze. I caught it earlier this morning. 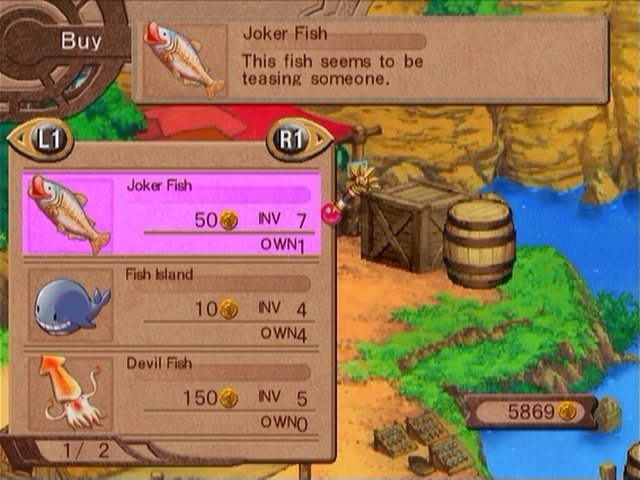 It's a Joker Fish. Why's this fish have such...weird lips? There's gotta be some reason for it. ...Huh. Those are goofy, now that she mentions it. 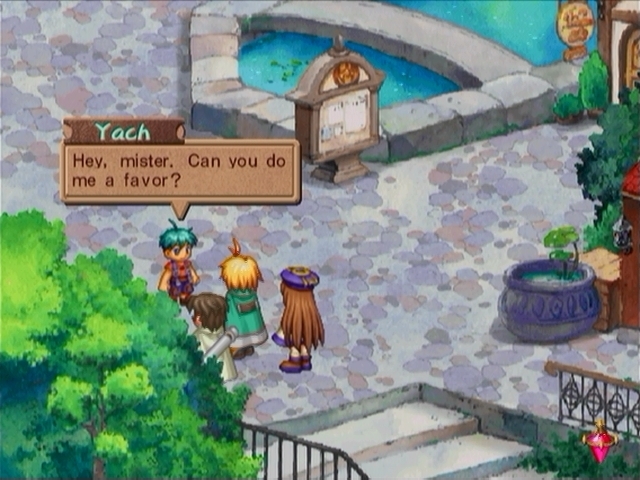 On my way to Veola's, Yach popped up to ask me something. As far as I remember, this automatically happens any time you find a new book. You're an alchemist, right? Can you teach me some alchemy? I don't know...I've never taught anyone before. 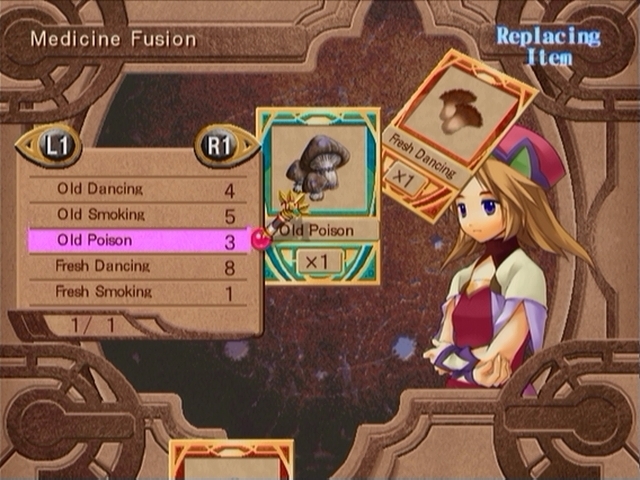 Alchemy's not as easy as it looks. You know that, right kid? But I really wanna learn! Really...please? You're really going to teach him, Klein? Here, this book should get you started. Cool! Magic in 7 Days! I'll finish it right away, mister! That book was awesome! 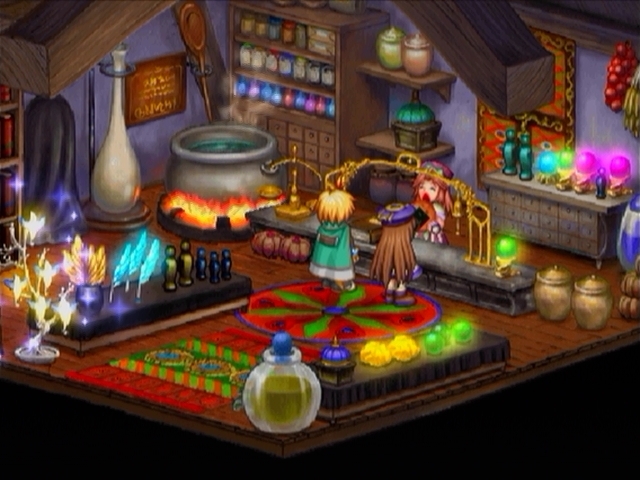 Now I'll start learning all about alchemy! Well, it's not like we're doing anything wrong. He's the one who wants to be an alchemist. There's a bomb up at the cathedral. I have no idea why. 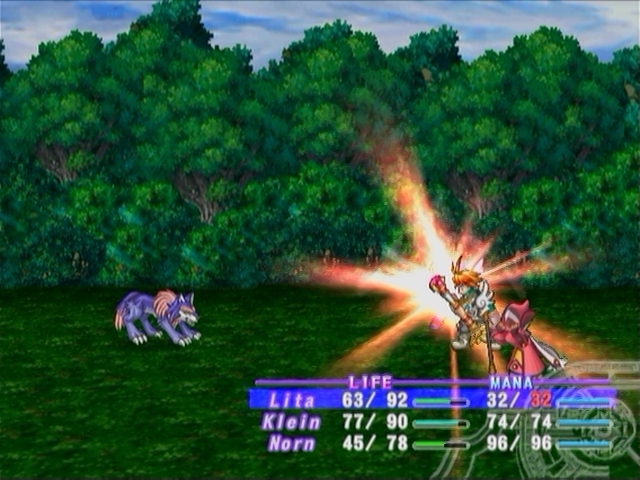 Klein can extract it for fire elements. Veola chomps on some sort of bread or giant cookie or something, during which time Klein stands around awkwardly. 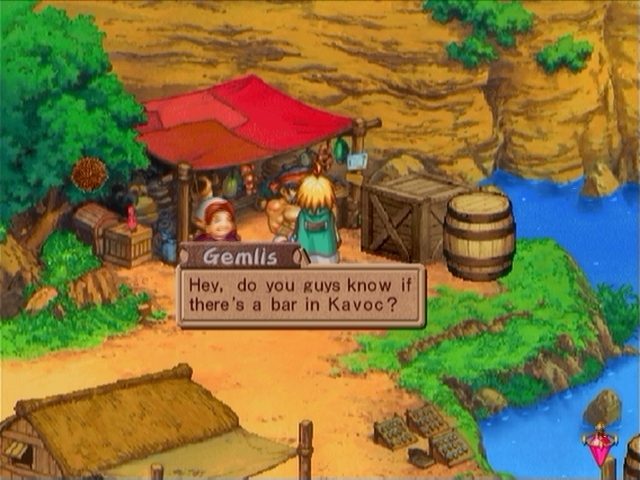 Mind if I visit your shop once in a while? You know, it's rude to eat while you're on the clock. It's my shop, and I'll do as I please. I happen to enjoy eating. But the customer is always right! Not when you're the customer. Wh...What did you just say!? Did you hear what she said!? She's the rudest person I've ever met! Please stop bothering the customers. 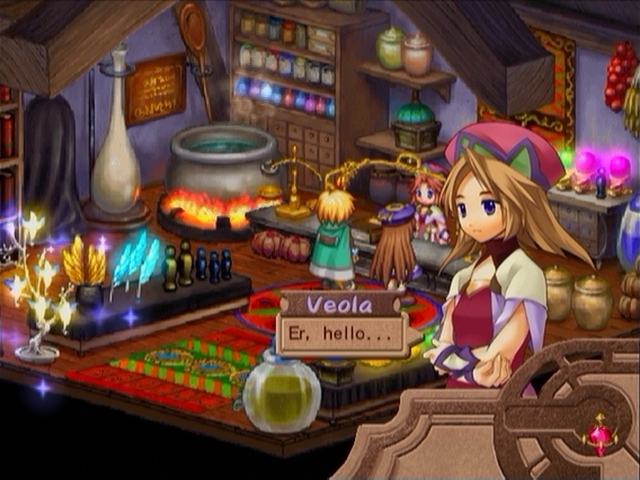 Veola is the best character. You know, in case you didn't pick up on that yet. 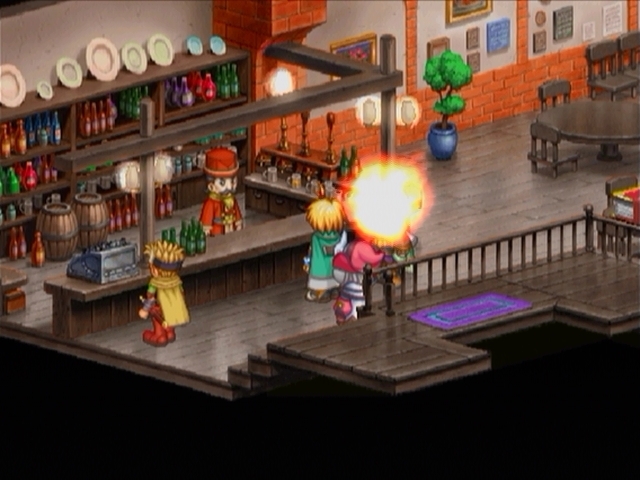 Also, the game does have an actual explosion sound effect that plays at that time. I thought that I might have done something to add stuff to Veola's menu, but it looks like that is not yet the case. I have some poison, and I thought I'd try to make medicine from it to see if I could make anti-medicine, but it just made more Blue Bull (?). Let's make a bomb instead! We need some kind of Legien (Red is the only one I have) and a Fest Stone or Fest Rock. Let's try a larger stone than the recipe asks for. 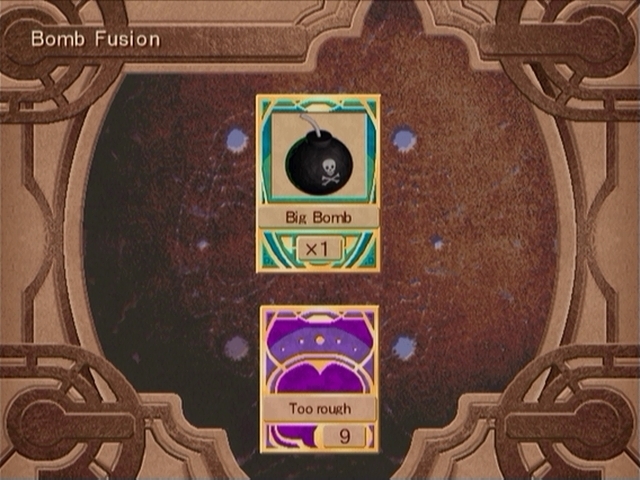 I had a lot of extra material, so I made a larger bomb. 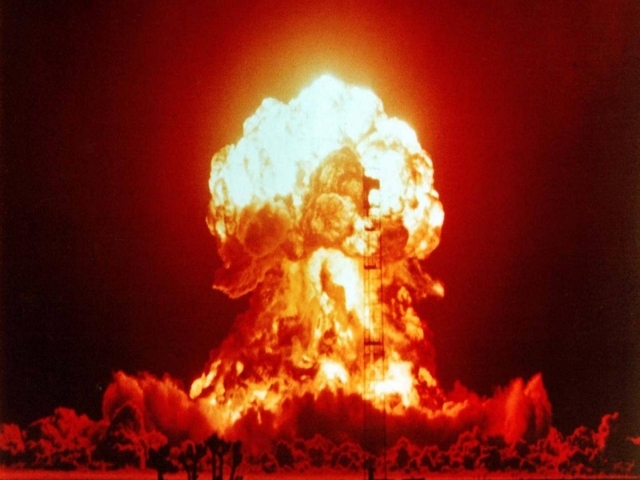 So this ones the Larger Bomb? No, I had a much better name in mind. 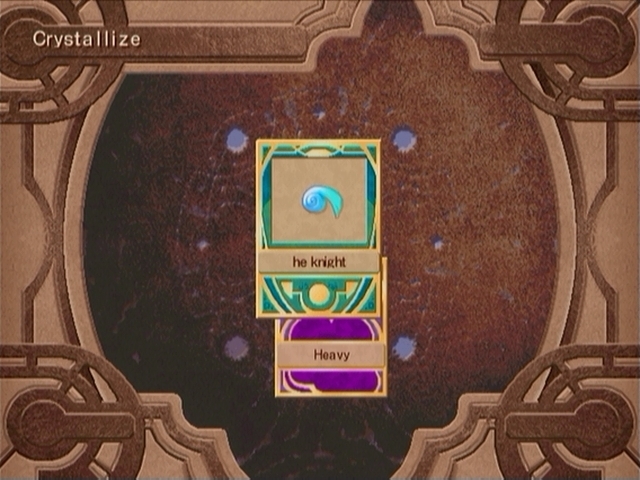 I'd forgotten how much people argue about item names. I mean, I remember some of the more noteworthy ones, but it's come up for like half of these now. That's it for shop synthesis, I'm afraid. Let's go home. Delsus leaves without a response. How many agendas does that guy have? You can take a nap until Delsus gets back. I must practice. I'll be back later. ...who collapses for no apparent reason. I didn't have a choice. There was no other way to defeat him. Uh-huh. 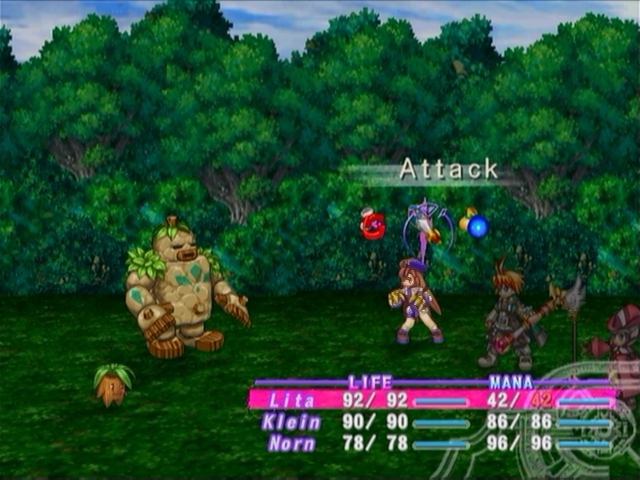 Let's go back to Klein and Lita. Why did you decide to go to Avenberry? I couldn't stop Mull...or even Arlin. I'm tired of being so weak...I'm going to train and get stronger...Then I'll show Mull what I'm really made of. No, not at all. Where's Delsus? Sigh...Norn and I will go track him down. You had your nap. C'mon, let's go. Let's do a couple more things here at base before we go find Delsus. This is the Mana Bath. We can use this to boost Lita's max MP back up to it's correct amount. 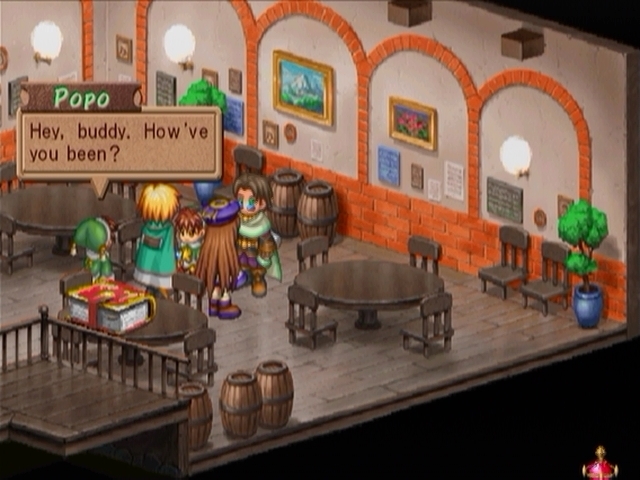 We need one element (wood for Popo, Fire for Uru, etc) per MP recharged. We can also use two Mana to split the cost between elements. Simple enough. 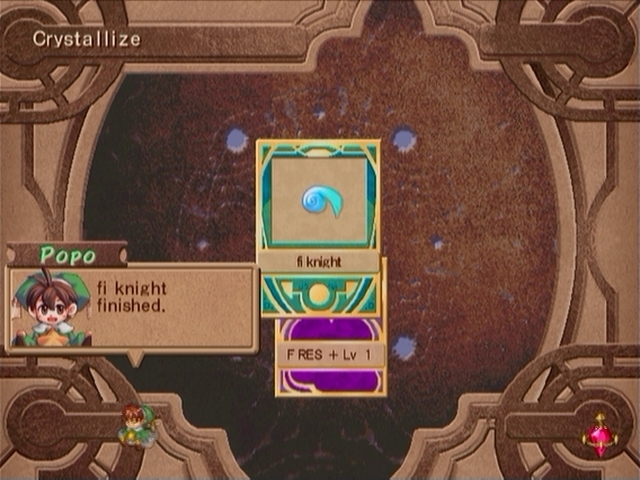 As the tutorial said, we just take Mana Stones and use a Mana to transform them into these crystals. I got these two. And voila! 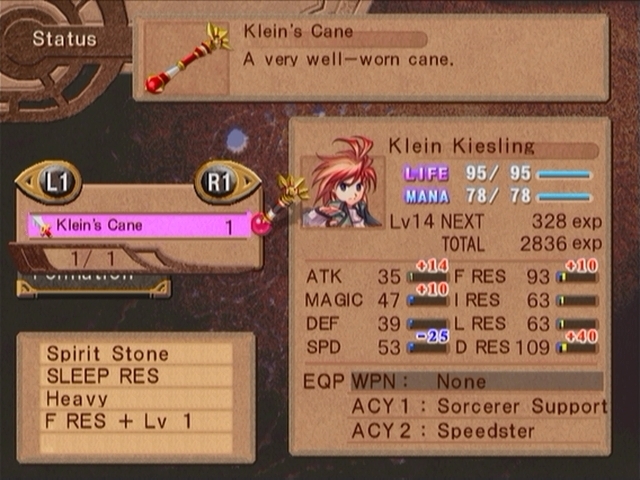 I have made Klein's Cane completely terrible by giving it a -25 speed penalty! ...I'm not very good at this. But I'll practice and see if I can make something better. 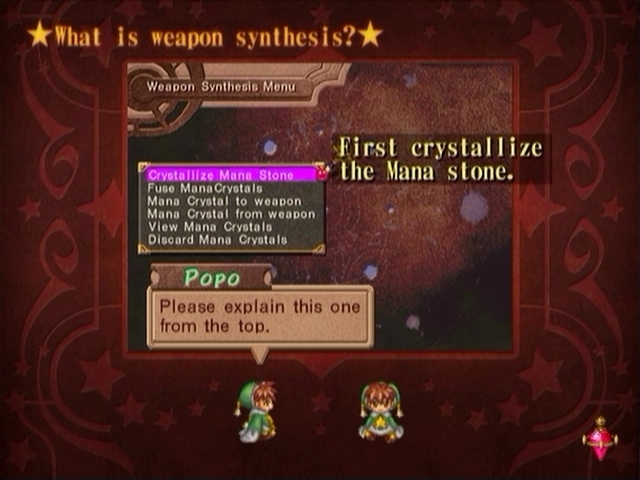 Fortunately, Mana crystals can also be removed from weapons, so I took it back off. 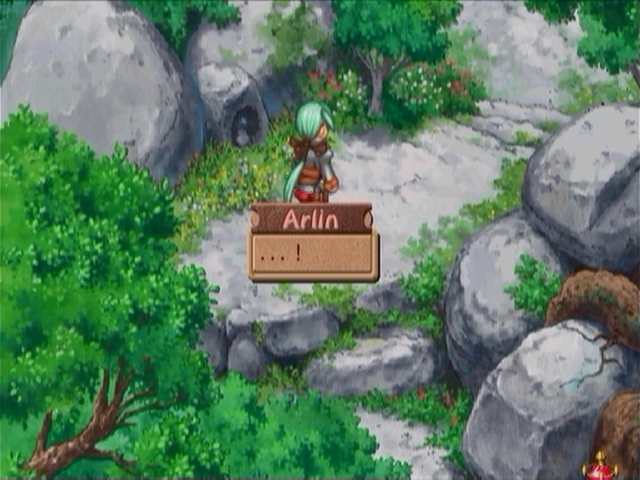 Yes, the Fairy's text box is cut off in-game. Hey, babe, do you have a number? Or should I just call you mine? The woman storms out of the bar. Where you goin' girl? 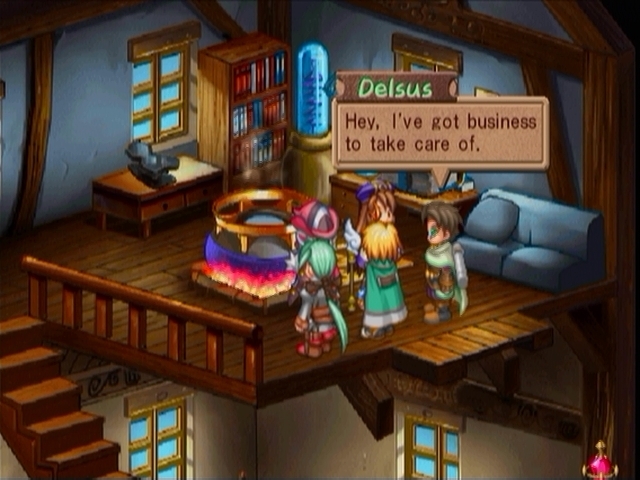 Aww man...What's your problem, Delsus? You scared her away! Me? I'm the only reason she came over here in the first place! That's funny...Because it looked like you were trying to hit on girls. You saw  Ahem, oh, that woman you saw? That was an old associate of mine. Right, Pilke? She's not your type. Trust me on that. You, Popo! I didn't think I'd find the Mana of Wood in a place like this. Not personally, but all fairies know the Mana of Wood. Despite appearances, we're different species...but all forest creatures are friends, dig? Hey, that's great. Um, I think this is where I cut out. Not so fast! I thought you wanted a job. Oh? You have a job? What kind? I can already tell this is going to be excellent. Yeah. Defeating it should net you a Super Puni Ball. Hook me up with one of those, and there's some serious cash in it for you. Don't rush it, though, I've got lots of time. So, did you get any information? Then what have you been doing this whole time!? And that's where we leave for today. Join me next time as we visit the Puni God.